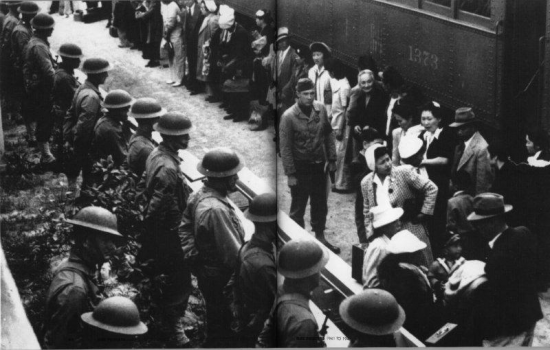 CUPERTINO — “Moving Days: The Japanese American Experience in the Santa Clara Valley” will be presented on Sunday, Nov. 18, at Cupertino Community Hall, 10350 Torre Ave, Cupertino. The following panelists will discuss what lessons can be learned from the World War II internment in terms of civil liberties. Free admission. Reception starts at 12:45 p.m. Introductions will be made by Mark Fink, Cupertino community librarian, at 1:30 p.m., and the panel discussion will be held from 1:45 to 3 p.m. The public is invited to view the “Moving Days” exhibit on the second floor. Tom Izu (moderator) is the executive director of the California History Center at De Anza College, where he has coordinated educational programs, including exhibition presentations, publication projects, local history courses, and campus forums, for the past 18 years. Izu has been active in the San Jose Japanese American community for many years and was involved in the movement for redress and an apology from the government for the incarceration of Japanese Americans. Ling Wu Liu is the director of the Korematsu Institute, which is dedicated to the promotion of pan-ethnic civil and human rights through education. The institute gets its name and inspiration from Fred Korematsu, one of the Japanese Americans who challenged the constitutionality of the internment in a landmark U.S. Supreme Court case. Liu is an accomplished print and broadcast journalist who has reported for Time in Hong Kong and CCTV in Beijing. She continues to write provocative articles and speak out in defense of civil liberties for the institute, which was founded in 2010. Stephen Doi is a faculty member of San Jose State University’s Asian American Studies program. Besides teaching courses on Japanese American history at SJSU, he is also an avid collector, archivist, and dealer in rare and important documents, books, and ephemera pertaining to Asian American history, as well as an attorney who remains active in the local Japanese American community. Jimi Yamaichi, the curator for the Japanese American Museum of San Jose, was interned at Tule Lake during the war and is a well-recognized leader of the San Jose Japanese American community. He has been active in educating the public about his community and the internment through his work with the museum and by helping to coordinate pilgrimages to the site of the former internment camp at Tule Lake. Presented by the Santa Clara Valley History Collaborative, which consists of the Cupertino Historical Society, the Santa Clara County Library and the Cupertino Library Foundation. Supported by the Japanese American Museum of San Jose, California History Center at De Anza College, and Friends of the Cupertino Library.